“One can’t just go off and write a 564-page book full of bitterness that does nothing but attack the male world. That’s simply unacceptable.” (Basler Nachrichten, 28 October 1958). This was the tenor of the reviews of Frauen im Laufgitter (Women in the Playpen). 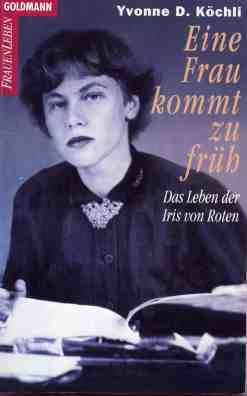 A literal campaign of hatred was directed against its author, Iris von Roten, who was even blamed for the defeat on 1 February 1959 of the vote on women’s suffrage in Switzerland. In her book the sharp-thinking journalist and doctor of law had recognized and critically analyzed the mechanisms of women’s oppression in western patriarchal society, long before they became accepted feminist truths: not without biting wit, she revealed “love” to be an instrument of power, motherhood a burden without social respect, housework a modern form of serfdom, and “democracy” a classical example of oppression. Devastated by the wave of hostile reviews, von Roten vowed to have nothing more to do with women’s topics; she was fed up with “casting pearls before swine.” She took up travelling and in 1960 drove her Fiat, alone, to Turkey for a six-month stay, eager to get to know the country and its inhabitants. Once back in Switzerland she soon completed a memoir of her stay in Turkey, but the manuscript was rejected in 1962, not to appear (severely shortened by the publisher) until 1965. She took the rejection hard—one wonders whether the German publishing house Ullstein had been warned about the “Swiss Emanze” (women’s libber)—but continued her travels. Counting Iran, Iraq, Syria, Lebanon, Marocco, Tunesia, Sri Lanka, Brazil among her destinations, von Roten was never without her drawing and painting supplies from the 1970’s on. With advancing age von Roten experienced the long automobile trips as too strenuous. Her worsening vision and chronic insomnia bothered her increasingly; she suffered in particular because she was no longer able to paint. For the brilliant woman with a strong aesthetic sensibility it seemed only logical to end her life at the right time. “Just as a guest has to know when it’s time to depart, a person should rise from the table of life while there’s still time.” Iris von Roten ended her life on September 11, 1990.